Howey, Hugh. Beacon 23. Broad Reach Publishing: 2015. Buy the complete novel here (I also recommend the audio-book). Can an ex-jarhead learn to love? 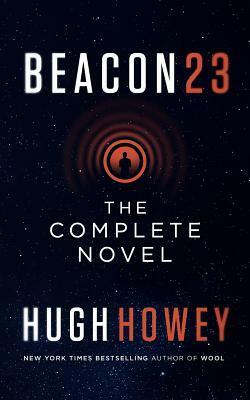 I’d say the answer to that, a la Avatar, is a resounding “yes”, and Hugh Howey agrees based on the content of Beacon 23. And more importantly, he crafts a story that works both as romance and as space opera (with hundreds of millions of lives on the line, no less). I only picked this up to read/review because of my fondness for several, if not quite all, of Howey’s other books, particularly Wool. That is to say, if someone pitched me a “The Notebook…but in space, and without the whole forgetting who the guy is thing!”, I don’t think I’d really have been sold. But Howey works considerable magic into this tale, which might well be his most poetically written yet. It’s an elegant mix of crass interiority and beautiful turns of descriptive phrase, painful honesty about (and from) the unlikely hero and tremendously empathetic passages that one can hardly read without growing a little teary-eyed. If we’re being honest, I blubbered a bit myself here and there during the story, and was forcefully struck by the beauty of certain passages, and by the powerful recurring metaphor of the space beacon-as-lighthouse, and the mysterious painting showing either a wise person resigned to a terrible fate or a fool with no clue about what is coming. Needless to say, the main character is revealed to be both the wise man and the fool, both worthy of love and desperately in need of it. But here’s the best aspect of this spacemance: the being both worthy of and in need of love character trait/flaw turns out to be the very quality the Other is trying to find, and the only thing that can, perhaps, bring an end to the cycle of interspecies warfare. To quote another Hugh(ie), it’s the power of love! I’m sure all that sounds cheesy, but remember how beautifully Howey crafts the story and you’ll begin to understand why it’s such a success. He’s created one of his most compelling characters yet, and arguably his most beautiful and emotionally evocative story. Fortunately or unfortunately, the story is also complete (like the first Matrix movie was complete), and can’t really accommodate a sequel (yes, all you Matrix Reloaded and Revolutions fans, I’m saying what you think I’m saying: those movies were as unnecessary as they were crapitudinous). In conclusion, if you like beautifully written romantic stories set in space, then it’s safe to say Beacon 23 is for you! Zhaoyun has been sniffling through many a spacemance since joining Nerds of a Feather as a regular contributor in 2013.